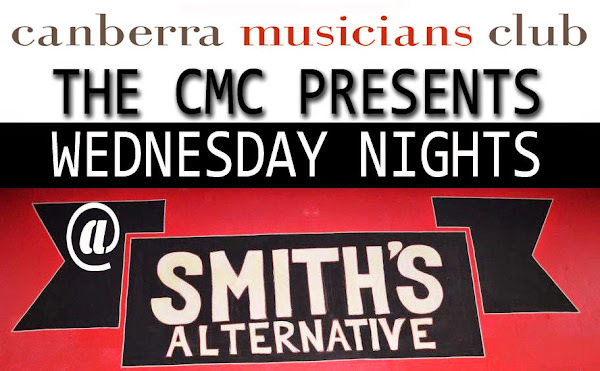 The Canberra Musicians Club is doing regular Wednesday night spots at the newly revamped Smiths Alternative in Civic. Last night I braved the cold and wet to check it out. The first thing any inner city venue needs is bicycle parking in spades. In this day and age driving to a gig is nothing short of tragic. Smiths has recently expanded pavement out onto Alinga Street, complete with trees, light poles, and not one but two sets of steel bike racks. Last night there was no cover on the door so that was a handy bonus. Beer was going for $7 a bottle of Coopers Pale. More expensive than The Front, but in Lyneham there’s usually a cover. There’s no tap beer at Smiths. Coming in from the wet and wild last night Smiths was warm and dry with comfortable seats and cosy nooks. It’s a small venue, 50 people would be about the limits of comfort I’d guess. The toilets require getting a key from the bar but are clean and modern, a major step up from The Phoenix or The Front. The stage is large and well lit. The sound system is run through an ipad which at least means the mixing desk is not taking up room. For mine the electric guitar was up too loud last night but it could be that’s how the band like it. We were treated to Chris Endrey and Hannah Beasley first up in Hannah’s debut. They’ve got some really cute songs and Hannah has an astonishing smokey sweet voice. Well worth checking out. Following that was the blokey whimsy of Jason Recliner who were the reason I’d come out on a bicycle in the rain. The setting is intimate, the service efficient, the sound is good, the stage is well lit, the seats are comfortable, and it’s warm.